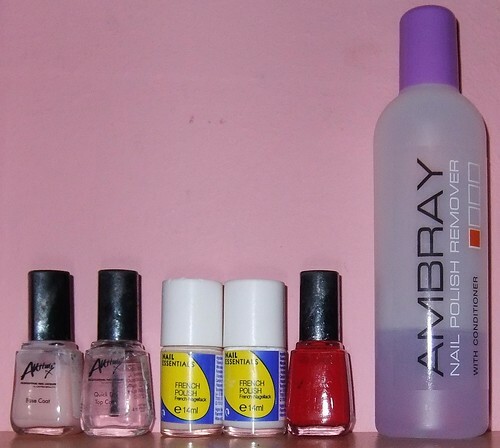 Remove any nail polish that is on the nail using a cotton pad and nail polish remover. Begin to file the nail. You must never file back and forth as this damages the nail. Always file in one smooth motion, from corner to corner. This will reduce the risk of your nail snapping. Buff nails. This will add shine. Next apply cuticle massage cream onto finger nails, massaging with your thumb and finger tips, and leave to soak in the water again. Repeat steps 1-4 on the other hand. Dry hands, then take a cotton pad and orange stick. Next you want to put some cotton onto your orange stick. To do this, split the pad into two and roll the orange stick so that it picks up the cotton wool. Apply cuticle remover cream to the orange stick and push cuticle back by rolling and pushing gently. Also clean under the nails to remove any dirt. Using nail polish remover and a cotton pad, remove excess oils. Apply base coat to nails, this gives your polish something to stick to and prevents any staining that may occur from your coloured polish. Apply colour to nail, using the three stroke method. Apply 2 coats depending on the polish. Finally finish off with top coat, this will prolong nail polish and give a shine to your nails.